See what So Smitten Special Events' clients have to say about their experience working with the Los Angeles wedding and event planning company. Check out all of our 5-STAR reviews on The Knot and Yelp! "Other than marrying my husband, hiring Marni to plan my wedding was the best decision I've ever made. I seriously couldn't imagine anyone doing a better job. She is one of those rare people who's extremely organized and detail-oriented without ever being high strung or stressed out. She is so fun and easy to work with. And she's got your back. At one point during the wedding I spilled my drink down my arm and she wiped it up with her sweater. That's the kind of person you want supporting you on your wedding day. She so quickly understood the vision we had for our wedding and made it so much better than we could've ever imagined. I was never once stressed out in the process of planning this wedding because I knew that Marni was thinking of everything and nothing would slip through the cracks. You will not find a better wedding planner than Marni. She's the absolute best!" —Valerie C.
"If you are planning a wedding you need to book So Smitten for your wedding! Not only was Marni incredible to work with she made my special day EXTRA special. If it wasn't for Marni my day wouldn't have been as smooth and wonderful. Thank you so much Marni for giving me the wedding of my dreams!" —Kristen M.
"Marni is THE ABSOLUTE BEST WEDDING PLANNER EVER!! She is super sweet, very professional, incredibly responsive and just all around awesome. I'm still amazed at how much Marni is able to accomplish at one time and how easy she makes everything seem. I'm not really a planner, and wasn't looking forward to planning a wedding for 200 people. But, with Marni there, the whole process really was so much fun. She totally took my husband's and my vision that probably didn't make sense on paper and made it a reality. The day was incredible, the ceremony and reception were more beautiful than I ever could have imagined, and best of all we could just enjoy our day and didn't have to worry about a thing. All of our guests were wowed by the beautiful decor and how seamless it seemed the ceremony and reception were (they said there was no lag time and things just moved along perfectly). And everyone in our wedding party commented at how awesome and on top of everything Marni was. My wedding day so far was the best day of my life and I know for a fact that Marni played a major role in making that happen. I cannot thank her enough, and I'm looking for other reasons to have a party so she can plan them!" —Alanna F.
"With Marni Farmer of So Smitten Special Events, nothing is impossible! She helped me plan an intricate, ultra unique, breathtaking garden wedding in only a few months. And she was able to articulate the style I wanted to achieve even before I could figure it out myself. What set Marni apart from the others is that she sincerely cared about all the details coming together as much as I did. Her joy and creative spirit made it fun. And her generosity amazed me when she consistently went the extra mile, which made it all happen. If you’re looking for a truly professional event planner that’s not high maintenance like some can be, I highly recommend Marni. Thanks to her, I was completely in the moment on my wedding day without one worry. It was pure joy. A dream come true. Thank you, Marni!" —Marcie G.
"Marni is the jam! She coordinated our wedding back in April, handled everything perfectly and professionally while executing our style. We couldn't have had a better day! Thanks Marni!" —Mike K.
"Marni and her team from So Smitten are awesome!! We hired them for Day of Coordination because we knew that we wanted to plan most everything ourselves but needed someone fantastic to organize and execute our wedding day. After our very first meeting, we knew Marni was the one! She works with extreme grace and confidence and has an impeccable eye for all things wedding. My husband and I were able to truly experience and enjoy our wedding day thanks to Marni and her incredible team. We would hire them again in a heartbeat!!!" —Eryn M.
"Unbelievable service, friendliness, precision, and organization...We decided since we were out of state to last minute hire a day of coordinator, Marni got us started, and Jill was the lead, we couldn't say enough good things about the process, I didn't have to worry about a thing, and although it was professional, I felt like I was treated like a friend, I would never recommend not using them to anyone getting married, 5 stars isn't enough....these ladies have it figured out, and going on...Awesome Job Jill!" —Andrea B. "My husband and I were so grateful to have our event in Marni’s hands. We contracted So Smitten for the “Day-Of” coordination services for our small Friday wedding. Beforehand, Marni met with us on Skype to go over the timeline and was super responsive to all our questions even weeks ahead of our day. It’s hard to describe everything that Marni and her assistant Chelsea were able to do for us the day of - from the minute I arrived until after the last guest Marni handled decor set-up, guest arrival, food service coordination, transition of guests from ceremony to cocktail hour to dinner/reception and was always advocating in our best interest with our venue. My family loved her and said Marni made their lives very easy at the end of the event - breaking down all the decor and packing up everything at the end of the reception. I’m so happy we went with Marni for our wedding. She is an absolute pro! Highly recommended." —Molly B. "Marni and the So Smitten Special Events team are AMAZING! We hired Marni as our day of coordinator, and it was the best decision we ever made. Because of her and her team, we were able to relax and enjoy the day! Marni is super down to earth, easy to work with, detailed oriented, organized, responsive, understanding, kind, genuine, and a million other wonderful things. She is very experienced, and with that, gave us the best tips, advice, and guidance during our preparation process. You can really tell she cares about her couples, and definitely goes above and beyond to help. Our wedding was around 250 guests and had multiple locations for the ceremony and site... and everything went so smooth. Everything magically just happened! This was all because of Marni and her team. If you are looking for the best wedding coordinator - look no further!" —Cynthia D.
"Marni was absolutely amazing from the first time I talked to her. Being a bride for the first time I felt like I didn't know where to start with planning. Marni was very organized and professional and made me feel at ease. She made valuable suggestions, gave wonderful ideas, and our wedding night went smooth as could be. I would highly recommend her to anyone looking for a great wedding coordinator!" —Andrea D.
"Marni Farmer is an absolute dream to work with. Not only was she beyond organized, but she also brought great creativity and ingenuity to our special day. Marni is kind, patient and a great listener. She truly took the time to understand our vision and made it all come to life. I highly recommend So Smitten Events to anyone looking for top-notch wedding planning and coordination services." —Danielle C.
"If you are struggling with wedding planning and want to have a stress-free day and not solely rely on your family you must hire Marni! From the night of our first conversation (Marni was just a few days post-partum which speaks volumes for her dedication to her business) I knew I had found someone who is very knowledgeable in her field but also a great listener who is able to make your wedding vision a reality. 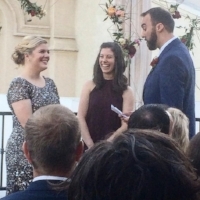 I hired her team for "day of" coordination but she began working with me before that, found our ceremony musicians and created a detailed timeline of the wedding which she distributed to my vendors and venue and saved my sanity. One week before the wedding (when I was ready to fall apart) she confirmed all vendors and everything that she was in charge of on the day of went flawlessly. I felt like I was in a dream and her team helped with cleaning up and making sure all our gifts were safe and secure in our room (so much better than depending on a family member who might have had too much to drink!). She was never bossy, always helpful and, to be honest, is a beautiful person inside and out. Having So Smitten help you with your planning will likely be the best investment you make during your financial armageddon, I mean wedding, planning." —Eliza O. "My husband and I can't say enough great things about Marni and So Smitten! We got married in October and wanted a "simple backyard wedding". Yea right! We would not have been able to plan without Marni's endless help, advice, and coordination. Although we only had her and her team for day of she did so much more! She was always available to answer my emails and give referrals throughout the whole wedding process and most of all really helped our wedding run as smoothly as possible! We are so so thankful!" —Stefanie M.
"People say that a day of wedding planner to handle A to Z is a luxury, but for the sake of the bride and those in the bridal party, it's a must!! Marni and her team didn't just provide us with day of service. They went above and beyond long before the wedding to make sure things were done in a timely manner and that we didn't miss any details. The cost was WAY below the value for their day of service and I only wish I could have afforded to have them do it all. They have an amazing eye/style and knowledge on bringing things together. Everything they did for us was so tasteful, gorgeous, and professional. I know that if I had tried to do things on my own, I wouldn't have been able to do a quarter of the amazing job they did. Even though our budget couldn't afford their full service planning, they took ownership in my vendor choices making it all work and come together beautifully. They kept me relaxed all day, spoiling us by making sure we had drinks and food, felt good, and if anything went wrong we didn't know about it! Marni and Jill are superwomen and I can't wait to need their service for our next party. ️️️ It's been a week since my wedding and I've already said this many times... So Smitten Events was the best investment in making my wedding day beyond anything I could have dreamed, not only for me, but everyone in my bridal party that would have been responsible for helping me do what they did for us on that day." —Karla N.
"Marni did a wonderful job on our wedding! From planning, preparation and execution, she was great!!! She made my wife's life SO MUCH easier by being available to support her in getting all the tasks done in a timely fashion. Marni has so many creative ideas & resources available that made planning our wedding an unforgettable experience. On the day of the wedding.... Marni seemed to be EVERYWHERE! & I loved that about her. I always felt supported by Marni because she was always present & active in making sure the ceremony and reception moved along on-schedule & smoothly. Marni was ALWAYS so pleasant & had a smile on her face. A very sweet spirit & such a nice woman!! Thank you so much Marni, you did such a great job & you made our day so memorable!!" —David H.
"Hiring Marni was the best decision we made. She took care of every detail without trying to alter our vision for the wedding. She has such a fun loving spirit and she makes even the most stressful details fun. We found a venue that did not really do a lot of weddings so it was one of the few venues that Marni had never done a wedding at. The site had some unique challenges but Marni took them on and really blew everyone away. The venue told me they want her for every wedding now. Many of the best ideas came from MARNI like adding in lawn games, since it was a botanical garden. The event felt like a royal fair and everyone, even my grumpy friends who hate weddings, told me they had a blast. When my wife and I wanted to do a Choreographed dance Marni designed the whole thing for us and it was a huge hit. Marni is such a positive person its hard to be stressed out around her. She just gets everything done with a smile. With Marni if you have an idea about what you want to do, she helps you make that a reality. If you don't know what you want she is right there with a bunch of suggestions. She is a genius for setting the right atmosphere and seems to have more props than Universal Studios. Honestly I can not imagine how this day could have turned out better and Marni was the best part of it." —Paul D.
"Marni helped me so much getting everything planned out. She stood back and let me be creative and design my own wedding while giving me the exact right amount of creative input to support my vision. She took my themes and made them into reality. What you get with her is your wedding, done your way but with the special magic Marni touch. Once the big day was here all I had to do was lay back into Marni's arms and let her handle everything. She is a total professional. No detail too small. Like when she didn't like the wall behind the dessert table because the pictures would not look nice, she created a very pretty back drop that made everything pop. She misses nothing. You feel like a Queen on the day of your coronation. All the stress was removed and none of the joy was diminished. I was able to just relax and let Marni do her thing and it was perfect. One girlfriend told me that she counted how many wedding she has gone to in the last 4 years. She counted 17 total weddings and said that this was by far the best ever." —Leslie H.
"Initially and naively I scoffed at a friend’s comment that at a minimum I needed a day-of wedding planner to help plan my daughter’s wedding. Enlisting the expertise of So Smitten Special Events as “day of” wedding planners was absolutely the best money I spent on the wedding!! While I had most of the big pieces in place and many of the small pieces, So Smitten was able to see those things I overlooked and also created that all-important timeline for the day. They assisted with communication with all participating parties – from vendors, to venue, to relatives, to the entire wedding party. Marni, owner of So Smitten and Jill, her lead coordinator, were an absolute pleasure to work with and were always so positive and gracious with all parties involved. They offered great ideas that we incorporated to make the day even more remarkable. Jill and her assistant took charge of details at the rehearsal, and the day of the ceremony and reception. I don’t know how they did all that they did to coordinate with all the various participants the day of the ceremony and reception, since both took place at the same venue – a cathedral in LA. I can truly say we could not have created this most beautiful wedding day we had ever seen without having enlisted So Smitten’s help." —Annette P.
"Marni and her team helped my daughter and I create a memorable event which was a blend of batz mitvah and quinceneara (we called it a Batzceneara). This event also coincided with my mother's 80th birthday. Although my friends said a planner was not necessary, I knew that I would be paralyzed if I undertook the planning of an event for 200 people on my own. Marni was accessible, detail oriented, creative and extremely patient with me as we moved through the process of making my daughter's vision of Batzceneara at Tiffany's a reality. I cannot praise So Smitten and Marni Farmer enough for all their time, work and dedication to our simcha fiesta." —Rachael K.
"Marni was the best wedding coordinator we could have asked for. She guided us through the entire process and seemed to have a solution or recommendation for any question we threw her way. She made our wedding day so much easier for us. Obviously my wife and I were really nervous about the day coming together the way we wanted it to, and Marni was there every step of the way to make sure everything was streamlined. The venue looked beautiful, everything was where it should be, and she kept everyone on track. Not only is she super organized and smart, but she's such a nice person, and helped make our day as beautiful as we hoped it would be. I cannot recommend her enough." —Joe A. "Marni was amazing. I hired So Smitten for the D.I.Y Day-of service, and I have no idea how my wedding would have run without having her and her team. I was happy putting together the wedding myself, but she was always there to answer questions, give recommendations, and guide me along the way since I had no experience with weddings. The week of the wedding she took over everything so that I was able to enjoy my time with friends and family. Everything ran so smoothly!! There is NO WAY my wedding day would have been so perfect without Marni's help. I'm actually still not sure if everything went perfectly or if things went wrong and she just fixed them before I ever noticed!! Either way, that's exactly what you want on your day! I was originally debating if I needed a coordinator or if I could do it all myself- but this was the smartest money I spent. I could NOT have done it all myself, and if I did there is no way I could have relaxed and fully enjoyed my wedding day. On top of all of this, Marni is a complete sweetheart. I couldn't have been happier with So Smitten. Thank you Marni!!!!! xoxo" —Katie M.
"Are we the first to post that we (my husband and I) are "So Smitten" with So Smitten?! If you want smart, creative, reliable, innovative, caring, detail oriented, task masters, and amazingly awesome women to helm your event then So Smitten is your choice, hands down. Marni and Megan are just incredible. They will guide you, advise you, listen to you, care for you and your event attendees, and make sure everything is absolutely beautiful and everyone is having a great time. They are extremely down-to-earth and wonderful people and creative planners." —Larke P.
"The best-value splurge we made for our modest reception. We wanted to "do it ourselves" but now we realize that that would have been ludicrous. We engaged her for "day-of-support" and it was perfect. Her structured system helped us get organized and she was always available for quick questions and guidance. The event went perfectly, and we still get lots of compliments on how enjoyable it was. Marni even made some things happen that we were prepared to skip, making it even more special and memorable. We are so grateful and will recommend Marni to anyone "threatening" to do it all themselves. Marni makes you feel calm and confident that you will actually enjoy your own wedding and so will your guests." —Shannon B. "Marni designed an amazing bridal shower for me! We had an Alice and Wonderland themed tea party. Every single detail was perfect. The centerpieces were stunning with stacks of vintage books, tons of little trinkets, and pretty purple flowers. We also had a great photo station with Alice themed props which made the party so fun. Marni even sprinkled little "drink me" signs on champagne glasses and put tiny keys throughout the tables as festive decor. All my guests raved about how lovely the event was and how the details made all the difference. " —Patricia G.
"I cannot speak highly enough of Marni Farmer and So Smitten Special Events. Marni made the entire wedding planning process go so smoothly. She is knowledgeable, approachable, and honest. She was very accommodating for all of our meetings, and prompt with email responses. I was stress-free the week of my wedding because I knew Marni had everything under control and had prepared me well. I highly recommend meeting with Marni to discuss how she can help you plan and execute your event. You will not be disappointed." —Genevieve H.
"To give everyone a little bit of a perspective we had exactly 1 year to plan our whole wedding and a budget that was below the national average wedding cost of $30,000 (which we got from the Knot and excludes honey moon, but includes everything else so brides/grooms can get ready!! Grab yo man/woman and crunch those numbers!). Yes our budget plan included the cost of a wedding planner so in reality we had even less than what is listed for the wedding. We had 90 guests give or take. Our style was whimsical rustic modern. We met Marni and Megan through The Knot. At the time we were in Washington D.C. working and needed to find some wedding planners to help us plan our wedding back home in California because well...we weren't physically there. We had a list of wedding planners who we called and actually met up with in person during a short trip back to California, but after meeting all the different wedding planners only Meghan and Marni stuck out in our minds. Marni and Megan were the most organized, most willing to work with us and our smaller budget (for a California wedding), most responsive, most flexible, most responsive, and most important of all they felt like our friends. They were completely honest with us every step of the way in terms of our expectations, but also went out of their way to make sure that our wedding was everything that we dreamed of. Even during times when we didn't know how we wanted our wedding to be and just had a general idea they were great in directing us to Pintrest to select images we liked and then...BAM giving us some awesome ideas that they had based on our selection! We never once regretted hiring Marni and Megan. The best part is that they each have their own talents and complement each other perfectly! Which makes sense since they have been friends for so many years :) They would skype us at least once every month at a minimum to make sure that we were all on the same page and we had numerous google docs (we mean the serious stuff: excel, word, you name it they'll do it!) to organize and communicate with each other constantly and they check! They always stressed that the wedding day was OUR most important day and if we had to even lift a finger or worry about anything on wedding day then we were doing way too much. We think that says more than enough about their character! 1) They are like the two best friends you wish you had planning your whole wedding. By the end you will wish to stay friends with them! So please, give these two a try. If not at least talk to them in person, on the phone, on skype. You will NOT regret this. We guarantee it. Our wedding was. AMAZEBALLS. Which basically just means amazing beyond belief. To end this...thanks for reading and THANK YOU SO MUCH SO SMITTEN!!!! You two are amazing! Their team is also amazing so shout out to them too :)" —Karen L.
"Marni and Megan were our dream coordinators and we couldn't have been happier with their services! I knew from the moment I met Marni that she was "the one" and when I met Megan for the first time I knew my wedding events were in great hands and I didn't have to worry about anything, and I was right! Marni and Megan totally knocked it out of the park for us and we couldn't be happier that they made our day everything we wanted it to be and more. Marni and Megan brought my vision to life and I felt like a princess on my wedding day all thanks to them! It was the first time they did a full blown Indian Wedding and they never skipped a beat. Their execution was always on point and they were so fun to be around! I especially appreciated their attention to detail which gave me the assurance I needed to know that my wedding would be exactly the way I envisioned it. Marni and Megan are also very artistic so the little touches that were added by them definitely gave my wedding that little extra wow factor. All my guests had an amazing experience and I owe that all to the fabulous team of So Smitten Special Events. I would definitely recommend So Smitten and will use them again for any future celebrations that we have. They are worth every penny! I actually had a coordinator before I met Marni, but once I met her, I just knew I had to have her be a part of my wedding and it was the best decision I made! Thank you so much Marni and Megan! We love you guys!" —Ekta M.
"After interviewing multiple wedding coordinators, we knew immediately that Marni and Megan were the ones to make our special day perfect! They understood exactly what our vision was for the day while adding great insight and suggestions for those things we might have overlooked. We went with their "day of" coordination package which was quite an understatement. After several meetings, countless phone calls and emails, location walk-throughs and rehearsal coordination, “day of" hardly covers the time spent on this event. They were extremely organized (impressive Excel spread sheets, timelines, etc.) and prepared for any and all unforeseen situations. Our entire wedding party was kept in the loop and emailed detailed timelines prior to the event. Megan and Marni made sure the day went off without a hitch; or at least without us knowing about it until after (including a centerpiece fire and wedding crashers). They told us we were the "stars" of the day and treated us as such. By the end we considered both Megan and Marni to be more than just our wedding coordinators, but our friends. We would love to work with both again for our next big event and would (and already have) highly recommended So Smitten Special Events to friends and family for their big day." —Dana J. "Marni and Megan are awesome. They really worked hard to put on the best wedding celebration possible. We were almost dumb enough to plan it ourselves, but they made the transition so easy, it was definitely the right move for us. They matched us up with the best caterer, handled the rentals and decorations without a hitch, and really made the whole event run smoothly. We could not have done it so well without them. Many of our guests said that it was the best party that they ever attended. Highly Recommended!" —Eric K.
"I have had the pleasure of knowing Marni and Megan for years. The term 'dynamic duo' is an understatement. These women make glitter look dull. Megan and Marni helped to organize many events for my wedding. They helped to coordinate and plan everything from my Bridal Shower to Bachelorette party and wedding festivities. I genuinely looked forward to all of my meetings—working with Megan and Marni was FUN! They have great ideas, completely respected my budget, and were very honest in managing my expectations. They worked seamlessly with my on-site wedding coordinator to ensure that everything was just perfect for my day. Having these two ladies on my side really allowed me to take a step back from all the stress of planning as I knew that they had everything covered. Their professionalism enabled me to relax and enjoy every moment. I would highly recommend their services to anyone who wants their own event to 'sparkle.'" —Katie T.
"I had a blast working with So Smitten! My entire bachelorette party for a weekend of wine tasting in Napa was completely planned for me, leaving a stress free weekend of fun with my girls. So Smitten even thought of adorable party favors and gifts for each of the attendees, adding that perfect special touch. Our wedding website and invitations were very important to me; I wanted it to set the tone for our wedding and get our guests excited. So Smitten did just that and more! The invitation packets had so much thought and detail put into every aspect-colors, accents, paper texture, it was really more than I could have imagined. Our guests loved the excitement and fun that was so present in our website, I didn't have to worry about these aspects at all. It was a huge relief! Then to top it all off they were secretly working with my brother to plan an amazing wedding surprise for the reception. Knowing how much I love dancing-they planned an orchestrated flash mob of the local high school band performing, "All You Need is Love". This thoughtful gesture is just another example of how great this duo is to work with! They really paid attention to what was important to us and took our requests to the next level of creativity and fun! I would recommend them to anyone looking for a memorable event." —Ali B. "My husband and I had such a wonderful experience with Marni! I love her!! Wedding planning can be SO overwhelming and stressful but having Marni and Megan with So Smitten there to help us along the way, was truly amazing and just made everything go so smoothly and stress-free. We planned our wedding in 8 months, which a lot of people will say isn't enough time, but So Smitten made it possible. I honestly didn't worry about anything! She listened to what we wanted to create for our wedding and put so much thought and detail into everything! She came up with such awesome ideas that we would have never been able to do on our own. Not only did they help us with finding all our vendors for our wedding, they also designed our save-the-date cards, wedding invitations, put together personal gift bags for all of our out of town guests and Marni choreographed our first dance for us! They also styled our engagement shoot and created beautiful personal touches all around our ceremony and reception site. --They seriously can do it all! One of the many special things she did for us was, she found a bagpiper to play as I walked down the aisle as a tribute to my husbands father who passed away a few years ago from cancer. He was Irish and I can't even explain how much that meant to my husbands mother and his entire family. That added so much to our wedding day and it is something that my husband and I will always cherish. I also have to add she found a vendor to make a gluten free wedding cake for us. I have celiac's disease so it was important to have a cake that I could eat! Our cake was amazing....the top layer was gluten free for my husband and I and the other layers were regular cake for all of our guests. It's not easy finding a bakery that will do that, tastes good and for a reasonable price but somehow Marni pulled it off. It tasted amazing, looked amazing and meant so much to me! My husband and I were very impressed with her professionalism and fun attitude. She was always there for us whenever we had questions or needed advice during the wedding planning process and she always got back to us in a very timely manner which is extremely important when you have so much going on with wedding stuff! I just had such a lovely time with her and she made the experience of planning a wedding so enjoyable and exciting. It's been a year since our wedding and friends and family still tell us all the time how much they loved all the special details from our wedding that So Smitten created for us. Currently, I am using her to help me create a very memorable surprise birthday party for my husband! I am so excited and my husband is going to be blown away!" —Janet C.
"The details, thoughtfulness, creativity, and personal touches that So Smitten adds to special events makes all the difference! When planning for our wedding, Marni and So Smitten special events was exactly what we needed without even knowing it! From the beginning - at our engagement photo shoot, Marni made sure that our poses and settings were perfect and she brought props that fit our personality and style perfectly! Marni even designed our save the dates and got them to us so quickly. For our wedding Marni did it again. The ideas she comes up with are genius and beautiful and better than I could have ever imagined! She staged the most incredible photos which made our wedding pictures and our first look more exciting and special than ever! Again, she hits it out of the park with her props and poses! To add the last perfect touch, So Smitten designed our wedding thank you cards and they were incredible. I know people who have framed them! Once I briefly commented on a font style that I liked and Marni remembered and used it for us - it's the little things she does that adds up and means the whole world to us. I am a controlling and anxious person but with Marni and So Smitten special events, I can be comfortable putting all of my trust in them and knowing it will be even better than I could have done or dreamt on my own. Marni has a gift of balancing her creativity and thoughtfulness with her client's desires and style. Her work/portfolio alone speaks volumes but just meet her once and you wouldn't want anyone else working with you through life's treasured times." —Rachel M.
"I cannot thank So Smitten Special Events enough for making my wedding day the best day of my life. I could not have done it without Marni. She took care of every aspect of decorations. So Smitten Special Events helped me find all kinds of decoration ideas for the wedding based on our beach theme and budget. Marni found all the best prices and companies to work with. She designed our Mason Jar gift based on a photo of our dogs and it was adorable. She was sooo professional and sweet. I felt like I was working with a friend. The day could have been so stressful but she made it go so smoothly and was a blast. I would recommend So Smitten Special Events to do any wedding. Trust me you will be happy you did!" —Jennifer A. "Marni and Megan are a great team together! From our initial meeting to our wedding day, Marni and Megan impressed us with how thorough and organized they were. The last month before our wedding was overwhelming, but they helped us tackle our big tasks with ease. Our bridal party repeatedly mentioned how impressed they were with our wedding coordinators! They kept our bridal party and important family up to date with the wedding weekend events. On our wedding day, they went above and beyond to make sure the little details were in place and our flowers/decorations were on point. We were also happy with how easy it was to communicate with them through email/phone. They make a great team and we couldn't have been happier with how our wedding day turned out. Thank you So Smitten Events!!!!" —Shiney J. "I've worked with Marni on a variety of projects over the years (including the decor for my wedding), and I can tell you that no one will work harder or more diligently to make sure everything is perfect. She has a dedication and an attention to detail that is unparalleled. To have that combined with a sophisticated eye for design and a heart that is truly in love with people and their stories is RARE. There is no one I would trust more with the most important days in my life." —Lauren M.
"So Smitten Special Events created incredible invitations for which we receive numerous compliments. They also created an amazing website that my wife and I absolutely adore. Everything matched perfectly with our color and theme. Marni's passion is obvious for what she does, and she was able to provide a fun and exciting environment in what can easily be a stressful time. Thank you!!" —Marie B.